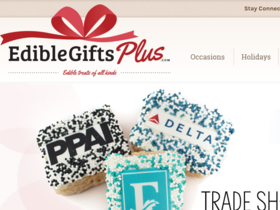 Use this coupon code online to save 15% off your entire order from Edible Gifts Plus. Act fast and enjoy a $10 discount on your order of $39+ with this coupon code from Edible Gifts Plus. Act now and save up to 40% off sale gifts from Edible Gifts Plus. Act now and get special Valentine's day treats from Edible Gifts Plus. Have a photo printed on a cookie online at Edible Gifts Plus. Check out Edible Gifts Plus online for their latest special offers.